This is a well organised and practical book which addresses a clear need. It is strongly focused on this particular examination and offers invaluable advice on question technique and answer formulation. It is backed up with evidence from established sources such as BNF. This book accompanies both Get Through MRCGP: Oral and Video Modules and Get Through MRCGP: Hot Topics. Focusing on teaching the reader how to structure their answers for the written paper, this title comprises five sample written papers for the MRCGP written module with each paper consisting of 12 essay questions and answers. 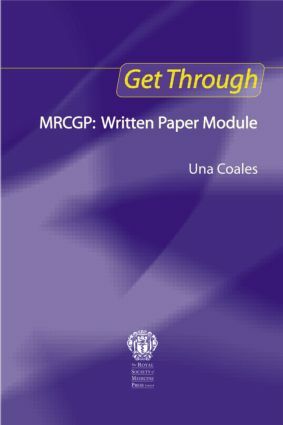 Recommended to all candidates and trainers for the MRCGP examination written paper, this title references sources including the weekly British Medical Journal, weekly Doctor and GP magazines, The Oxford Handbook Series, the BNF, BMJ Clinical Evidence and websites of all current government and Royal College guidelines. The author, Una Coales MD FRCS FRCSOto DRCOG DFFP MRCGP, trained in medicine in the USA and moved to the UK to practise. She is currently a GP registrar and has written several popular exam texts including PLAB and DRCOG having passed each exam herself. Dr Coales also runs her own MRCGP courses in London. Good resource for MRCGP preparation in terms of helping potential candidates to get into the right 'mindset' to tackle the written paper and to formulate a framework around which to structure their answers.